In spring in 1916 Lucia Dos Santos age 9, and her cousins, Francisco and Jacinta Marto, ages 8 and 6 respectively, were at a meadow with their sheep in (hamlet of Fatima). It started raining, and they hid in a small cave to escape the rain. After the rain stopped and the sun came out, they stayed in the cave to eat their lunch, say the rosary and play a game of jacks. They had played but for a short while when, on the serene day, a strong wind blew that swayed the trees and a sudden white light enveloped them. In the middle of that light appeared a cloud in the form of a young man who said to them: "Fear not! I am the Angel of Peace. Pray with me!" The angel knelt on the ground and bowed very low. The children imitated the angel and repeated his words three times: "My God, I believe, I adore, I hope, and I love You. I beg pardon of You for those who do not believe, do not adore, do not hope, and do not love You." Then he rose and said: "Pray this way. The Hearts of Jesus and Mary are attentive to the voice of your supplications." It Occured in summer, when the seers were playing near the well of Lucia's house. The Angel said to them: "What are you doing? Pray! Pray a great deal. The Hearts of Jesus and Mary have merciful designs on you. Offer prayers and sacrifices continually to the Most High." The children asked: "How must we sacrifice ourselves?" The angel said: "Make everything you do a sacrifice, and offer it as an act of reparation for the sins by which God is offended, and as a petition for the conversion of sinners. By this you will bring peace to your country. I'm its Guardian Angel, the Angel of Portugal. Above all accept and bear with submission all the suffering the Lord will send you." From that moment, they began to offer to the Lord everything that offended Him, without trying to find any other ways of mortification or penance other than passing hour after hour, bowed to the ground, repeating the prayer that the angel had taught them. Third apparition of the Angel. It occured in autumn at Cabeco. The children started prayers when they saw the angel, which had in his hand a chalice over which hung a Host, from which fell in the chalice some drops of Blood. He knelt and repeated three times with the children: "Most Holy Trinity-Father, Son, and Holy Spirt-I adore thee profoundly. I offer thee the most precious Body, Blood, Soul and Divinity of Jesus Christ, present in all the tabernacles in the world, in reparation for all the outrages, sacrileges and indifferences whereby he is offended. And through the infinite merits of His Most Sacred Heart and the Immaculate Heart of Mary, I beg of Thee the conversion of poor sinners." Then he rose, took the Host, and gave it to Lucia, while the contents of the chalice he gave to Jacinta and Francisco, and said: " Take the Body and the Blood of Jesus Christ horribly outraged by thankless men. Recover their sins and comfort your God." On Sunday May 13th 1917 the children were pasturing their flock as usual at the Cova da Iria, which was about a mile from their homes. They were playing when suddenly a bright shaft of light pierced the air. They described it as a flash of lightning. It was not really lightning, but rather the reflection of a light that approached little by little. Frightened by the flash, the children looked around at the sky that was clear and bright without the least spot of a cloud. No breeze stirred, the sun was strong, and there was no hint anywhere of a storm that might be responsible for a flash of lightning. The children, however, thought that they had better head home in case it might start raining. As they descended the hill. Another flash of lightning took them by surprise. Panicky with fear, they took a few steps and looked towards the right. There, standing over the foliage of a small holmoak, "a lady dressed all in white, more brilliant then the sun, shedding rays of light, clear and stronger than a crystal glass filled with the most sparkling water, pierced by the burning rays of the sun". The lady spoke to them and said: "Fear not! I will not harm you." "Where are you from?" the children asked. "I am from heaven" the beautiful lady replied, gently raising her hand towards the distant horizon. "What do you want of me? ", Lucia asked. "I came to ask you to come here for six consecutive months, on the thirteenth day, at this same hour. I will tell you later who I am and what I want. And I shall return here again a seventh time." Lucia said : "Do you come from heaven...and will I go to heaven ?" " Yes, you'll go". "And Jacinta?" "As well" " And Francisco?" "Him too , but he will have to say many rosaries". In the end Our Lady asked : "Do you wish to offer yourselves to God, to endure all the suffering that He may please to send you, as an act of reparation for the sins by which He is offended, and to ask for the conversion of sinners?" "Yes, we do." said the children. "You will have to suffer a lot, but the grace of God will be your comfort. "Then she opened her hands with a loving gesture of a mother who offers her heart. From it an intense light departed that seemed to go through them. The vision vanished telling them : "Recite the rosary every day to obtain the peace for the world and the end of the war." And She disappeared. On June 13 1917, accompanied by about 50 people, the children were reciting the rosary, when there was again the lightning, and immediately after the Lady on the holmoak appeared like in May. "What do you want from me?" asked Lucy. "I wish you to come here the 13th of next month; that you say the Rosary every day, and that you learn to read. In succeding months I will tell you what else I want." "I would like to ask you to bring us to Heaven", said Lucy. "Yes, Giacinta and Francis will be among the few, but you must stay here for a long time. Jesus wants to help Himself of you to make Me known and loved. God wishes you to remain in the world for some time because He wants to use you to establish in the world a devotion to my Immaculate Heart. I promise salvation to those who embrace it, and their souls will be loved by God as flowers placed by myself to adorn His throne." Lucy asked: "Will I stay here alone"?, "Don't be discouraged , I will not abandon you ever. My Immaculate Heart will be your refuge and through it will conduct you to God." Then She opened her hands and emanated her light on the children, Giacinta and Francis seemed to be in the light that went up toward the sky, Lucy in the light that spread on the earth. In front of the palm of the right hand of the Lady there was a heart surrounded by thorns that impaled it. They understood that it was the Immaculate Heart of Mary affronted from the sins of men, and She then asked for reparation. On July 13 1917 they recited the rosary with the crowd, they saw the usual reflex of light and then the Lady on the holmoak. Lucy asked: "What do you want from me?" She answered: "That you come the 13th of the next month, that you continue to recite the Rosary every day to our Lady of the Rosary to obtain peace in the world and the end of the war, because only She will be able to aid you." Lucy said " I want to ask you to tell us who you are, and to make a miracle for the crowd to believe that you appear." She Answered: "you continue to come here. In october I will tell you who I am, that which I want, and I will do a miracle that all can see and believe. Sacrifice yourselves for sinners, and say often this prayer, especially during any sacrifice: "O my Jesus, I offer this for love of Thee, for the conversion of poor sinners, and in reparation for all the sins commited against the Immaculate Heart of Mary.". As she spoke these words, Our lady stretched out her hands, and bright rays came forth which seemed to penetrate into the earth. All at once the ground vanished, and the children saw Hell, frightened they lifted their eyes to the Lady who told them:"You have seen Hell, where the souls of poor sinners go. To save future souls God wishes to establish in the world the devotion to My Immaculate Heart. If people do what I tell you, many souls will be saved." Then She said:" If my requests are granted, Russia will be converted and there will be peace. If not, she will scatter her errors throughout the world, provoking wars and persecution of the Church. The good will be martyed, the Holy Father will have much to suffer, and various nations will be destroyed...But in the end, my Immaculate Heart will triumph. The Holy Father will consecrate Russia to me, Russia will be converted, and a certain period of peace will be granted to the world". "Do you want to learn a prayer?" the vision asked, "Yes we do!" the children responded. "When you recite the Rosary, say at the end of each decade: Oh My Jesus, forgive us our sins, save us from the fires of hell, and lead all souls to Heaven, especially those in most need of Your Mercy." In August the children were prevented by the civil authorities to go to the meeting of the 13th in which had gathered an immense crowd. The children for two days were confined and threatened with many torments to make them deny, but they did not surrender, they were ready to offer their lives not to betray the promises made to the Lady. When they had been released on August 19, while they fed the flock in a place called Valinhos they saw the Lady above a holmoak. " What do you want from me?" Lucy asked. "I Want you to continue to go to the Cova da Iria on the 13th, that you continue to say the Rosary every day. I, in the last month will make the miracle that all will believe." Then with a sadder appearance told them: "Pray, pray a lot and offer sacrifices for the sinners. You know that many souls go the hell because there is none who pray for them." On September 13th the children and about 30.000 persons accompanied them to the Cova da Iria and they there recited the Rosary, soon after appeared the Lady on the holmoak. "I Want you to come here on October 13 and that you continue to recite the Rosary to obtain the end of the war. In October the Lord, the sorrowful Lady, the Lady of Mt. Carmel, and St Joseph with the child Jesus, will also come to bless the world. God is glad of your sacrifices, He does not want you to sleep with the chord to the sides, use it only during the day." On 13 October 1917 the children surrounded by a crowd of 70.000 persons under a torrential rain, Lucy asked again of the Lady:"What do you want from me?" she answered: "I am the Lady of the Rosary, I desire here a chapel in my honor to be built, that people continue to recite the Rosary every day. Will the war finish. The war is going to end, and the soldiers will soon return to their homes." Then Lucy asked: "may I ask you for cures and conversions, will you grant them?". "Some yes, others no. It is necessary that they ask pardon for their sins, that they don't offend God our Lord,and that he is already too much offended." "Do you Want anything else from me?" Lucy asked. "I do not want anything more." Then She opened her hands again and She launched a ray of light in the direction of the sun as Lucy shouted that they should look at the sun. At this point the promised sign happened, Lucy shouted to look at the sun, the rain stopped suddenly and there appeared an exceptionaly bright sun but not dazzling. The sun began to turn as if projecting in each direction bands of light of each color that lit and colored the clouds, the sky, the trees, and the crowd. It stayed for some moments then it went back to its normal position, it stayed still for a small while and then it happened again. Suddenly it looked as if it stood out from the sky to fall headlong on the crowd, that was looking terrorized, they fell to their knees and begged mercy. Meanwhile the children saw a Lady dressed like the white of the sun with a blue cope, St. Joseph with the Child Jesus that blessed the world.Then after this vision they saw The Lord bless the world, standing next to Our Lady of Sorrows. After these visions the Lady of Mt Carmel finished the miracle. The people then became aware that there clothes were completely dried. One of the principal anti-clerical publications of the day was O Dia, a major Lisbon newspaper. On October 17th, O Dia reported the following: At one o'clock in the afternoon, midday by the sun, the rain stopped. The sky, pearly gray in color, illuminated the vast arid landscape with a strange light. The sun had a transparent gauzy veil so that eyes could easily be fixed upon it. The gray mother-of-pearl tone turned into a sheet of silver which broke up as the clouds were torn apart and the silver sun, enveloped in the same gauzy gray light, was seen to whirl and turn in the circle of broken clouds. A cry went up from every mouth and people fell on their knees on the muddy ground. The light turned a beautiful blue as if it had come through the stained-glass windows of a cathedral and spread itself over the people who knelt with outstretched hands. The blue faded slowly and then the light seemed to pass through yellow glass. Yellow stains fell against white handkerchiefs, against the dark skirts of women. They were reported on the trees, on the stones and on the serra. People wept and prayed with uncovered heads in the presence of the miracle they had awaited. 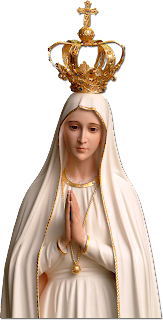 THE MESSAGE OF FATIMA in vatican site.